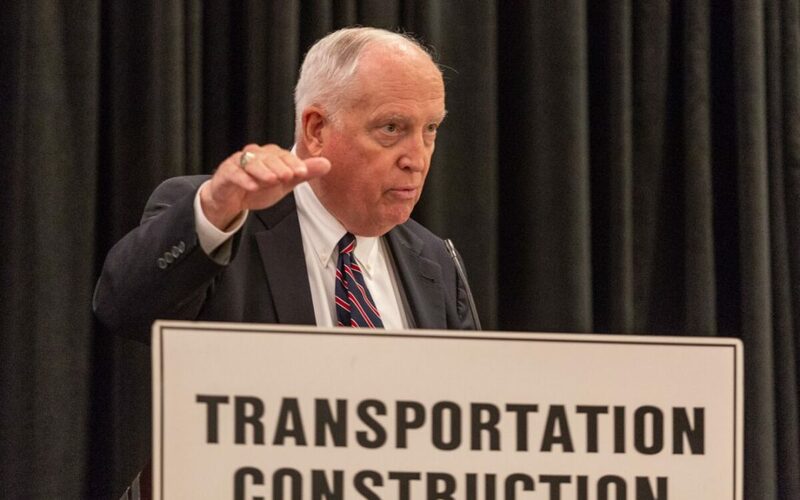 ARTBA President Pete Ruane addresses the May 15 TCC Fly-In. ARTBA members and other transportation construction industry leaders advocated for a permanent revenue solution for the Highway Trust Fund (HTF) and received briefings on key infrastructure policy issues and market conditions at ARTBA’s Federal Issues Program (FIP) and the Transportation Construction Coalition (TCC) Fly-In, May 14-16 at the Grand Hyatt Washington. White House Council on Environmental Quality Associate Director of Infrastructure Alex Herrgott, Senate Environment & Public Works Committee Ranking Member Tom Carper (D-Del. ), and House Highways & Transit Subcommittee Sam Graves (R-Mo. ), addressed the May 15 TCC legislative session. The following day, attendees fanned out on Capitol Hill to meet with their members of Congress. The FIP program also featured the “State of the Transportation Construction Industry: Women Executives Panel,” ARTBA Foundation dinner honoring the 2016, 2017, and 2018 Transportation Development Hall of Fame classes, and Foundation Awards Luncheon.